Clients are often asking me what I think about the value of LinkedIn for networking. For those of you that don’t know already, we LOVE Hootsuite at HC. 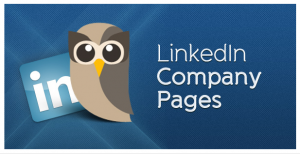 It’s a great way to manage all of your social media pages in one place, and they also offer management for LinkedIn Company pages. On top of that, they have a great blog where they offer tips and advice on how to keep your social media moving in the right direction.